Last September, President Santa Ono voiced his support for all of UBC’s faith communities in a speech which addressed rising Islamophobic sentiments. However, he refrained from directly promising any significant administrative action to accommodate the increasing number of Muslim students on campus. 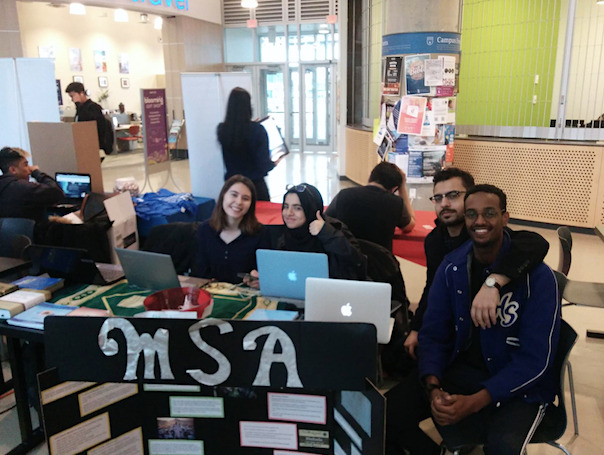 The Muslim Student Association (MSA), which serves as a home and representative body for Muslim students at UBC, maintains that administrators have been helpful. However, the group still has concerns as they continue to grow. The MSA hosts events such as “Islam Awareness Week” and “Chat and Chai” in order to open up discussions to a range of diverse opinions and experiences here at UBC. Executive member Meryem Katırcıoğlu explains that the club hopes to be a community-oriented space. The diversity within the community, as well as each student’s personal approach to their faith makes it difficult to be a representing voice for all Muslim students. This was demonstrated after a survey taken about student perceptions of Islam and the MSA had some people claiming that the MSA’s events were too liberal, with others suggesting that they were too conservative. As Ramadan approaches, Mohamoud also voiced his concerns about prayer space. While Friday prayers are important to Muslim students all year, prayers become particularly significant during the month of Ramadan. Friday prayers at Totem Ballroom are becoming increasingly overcrowded and securing a larger prayer area has been a constant issue for the club in previous years. “It’s a bit of a fire hazard,” joked executive member Hussain Khan.